New models of shellers, fish skinners and peelers. Discover our new models of shellers, fish skinners and peelers. We have renewed our catalogue! We invite you to visit our extended selection of fish processing machinery. Products for the handling and preparation of fish in the food, fish and fish markets. These are new products from the Belgian brand Cretel, an international reference in the field of peeling, derinding and skinning machines. Behind them, more than 40 years of experience offering affordable solutions of first quality. Flaking machine: for the fast and efficient removal of flakes from all types of fish. Fish peeler: table for peeling fish and meat that is ideal for small and medium industries. Herringbone remover: machine for removing the bones from salmon and trout fillets, widely used in fishmongers' shops. 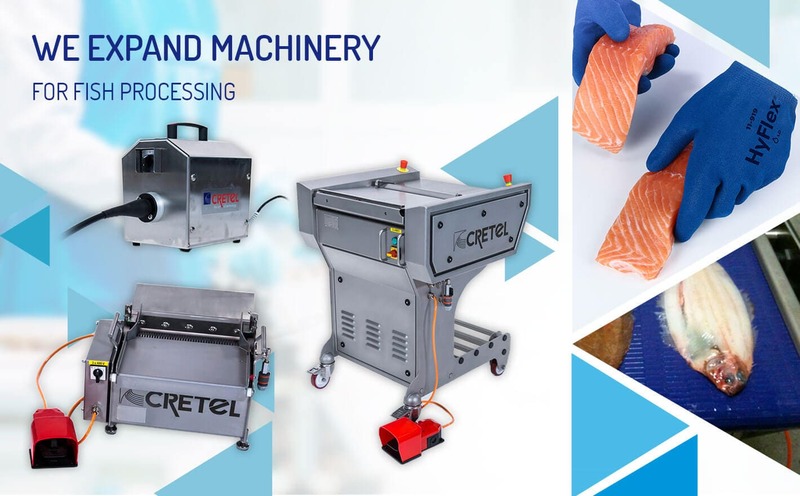 Facilitate the peeling, shelling and removal of fish bones easily in the industry or in the fishmonger with Cretel machinery. If you have any questions about the fish or meat machines offered in the section, do not hesitate to contact Reysan and our team will try to offer you the best solution.